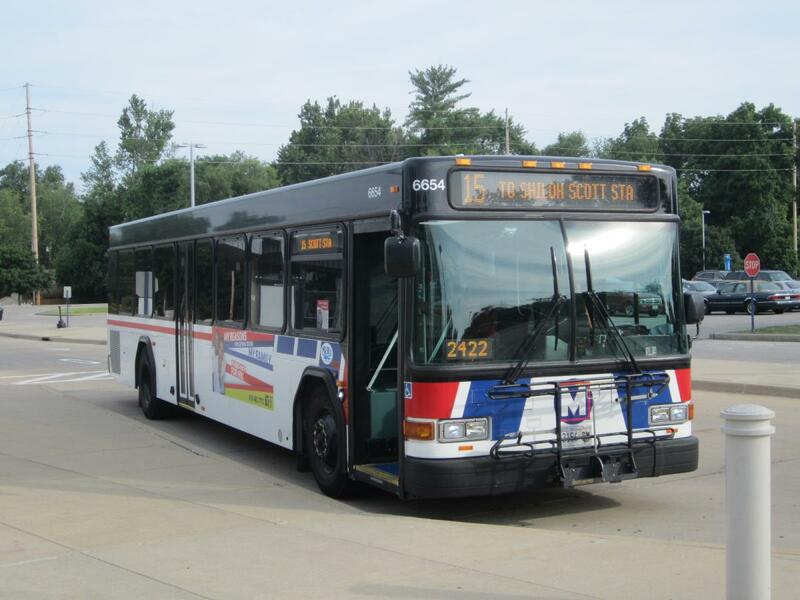 St. Louis Metro's fleet of 360 buses consists mainly of Gillig Phantoms ranging from years 1992-2004 and sizes of 30ft, 35ft, and 40ft, though there are currently 26 35ft Gillig Low Floors from 2008. 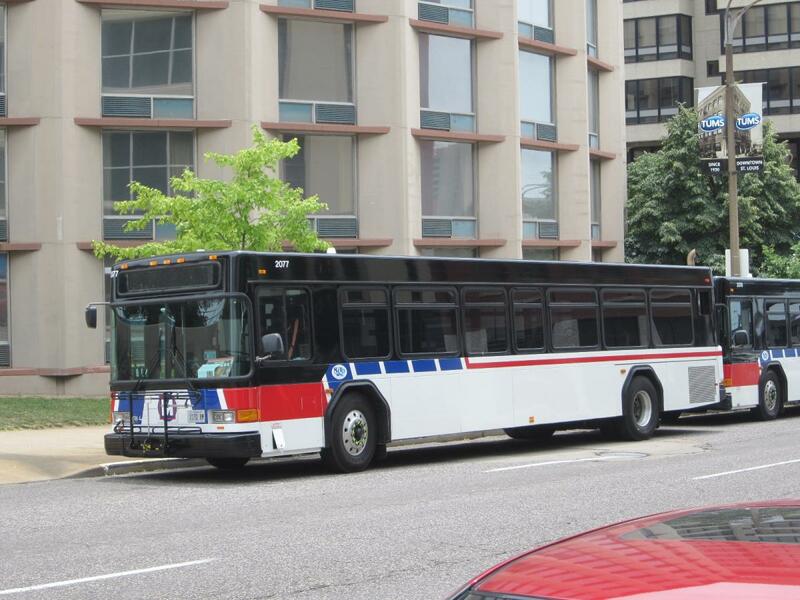 Metro intended to buy more new buses back in 2009, but budget and funding constraints made them put off their purchases. Now that proposition A passed, this means restored service and an emphasis on modernizing the fleet. 21 new Gillig Low Floors are scheduled for delivery in the first quarter of 2011, including 7 40ft buses and 14 35ft. Approximately next September, 29 more 40ft Gillig buses will arrive. 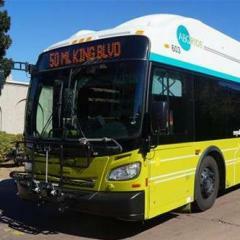 Metro has an agreement with Gillig up until 2013. 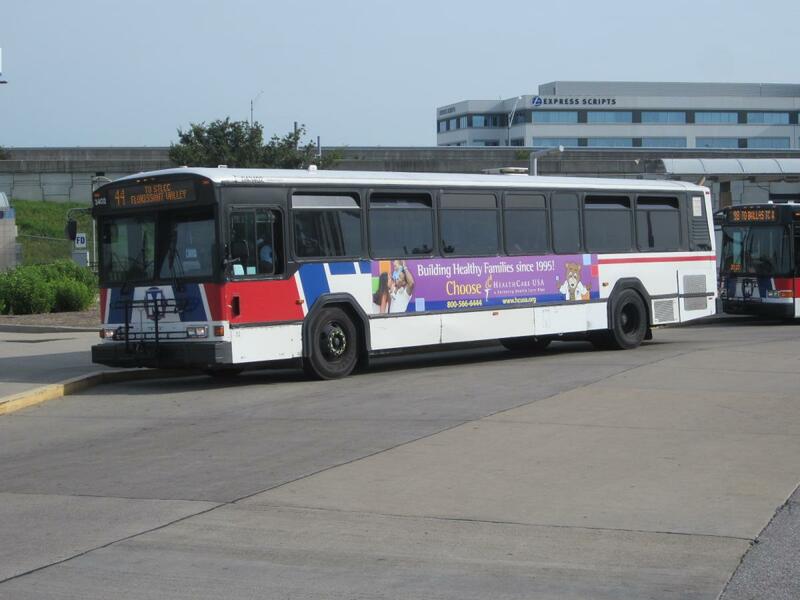 2008 Gillig LF during a layover at the CWE transit center. 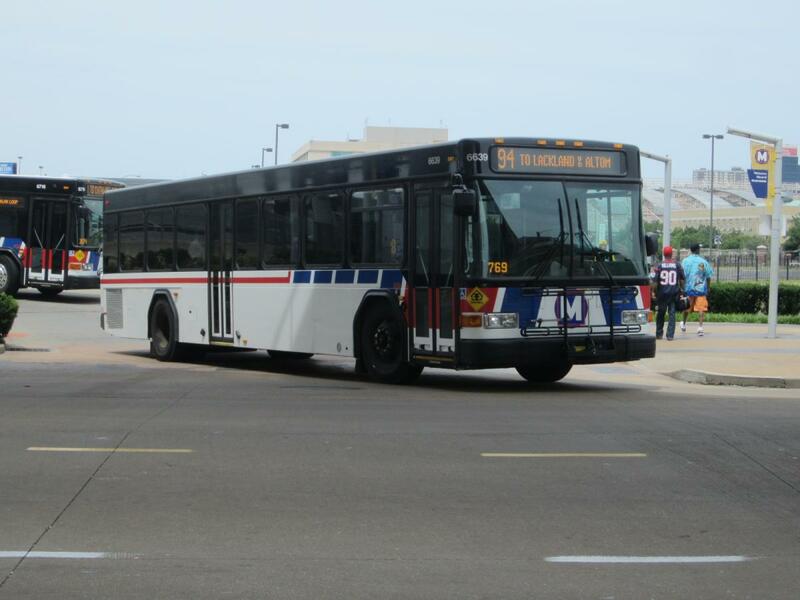 Gillig Phantoms, the backbone of Metro's fleet. Note: This video has Neoplan AN440 CNGs, Metro retired these back in March 30, 2009 when they drastically reduced service. 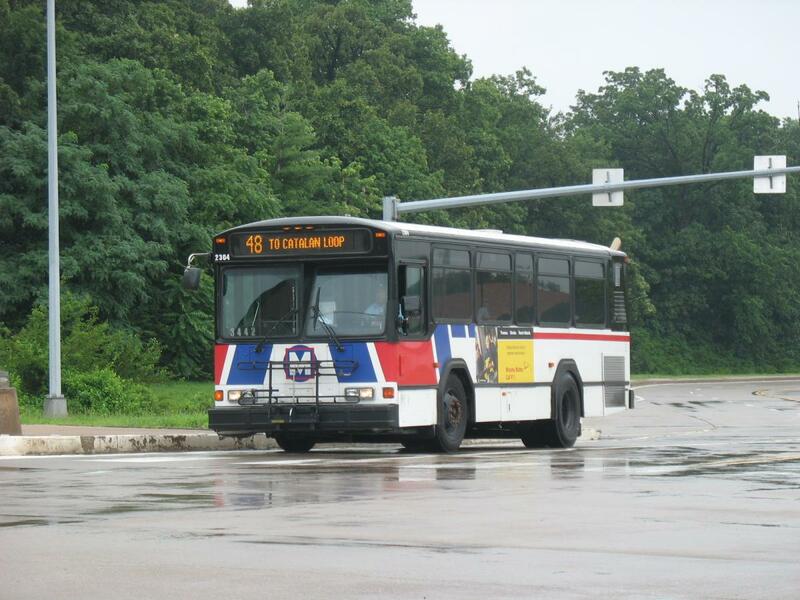 During the 1990s Bi-State/Metro's fleet was majority the Flxible Metro along with Neoplans, and GMDD New Looks. The Flxibles were retired in 2003. 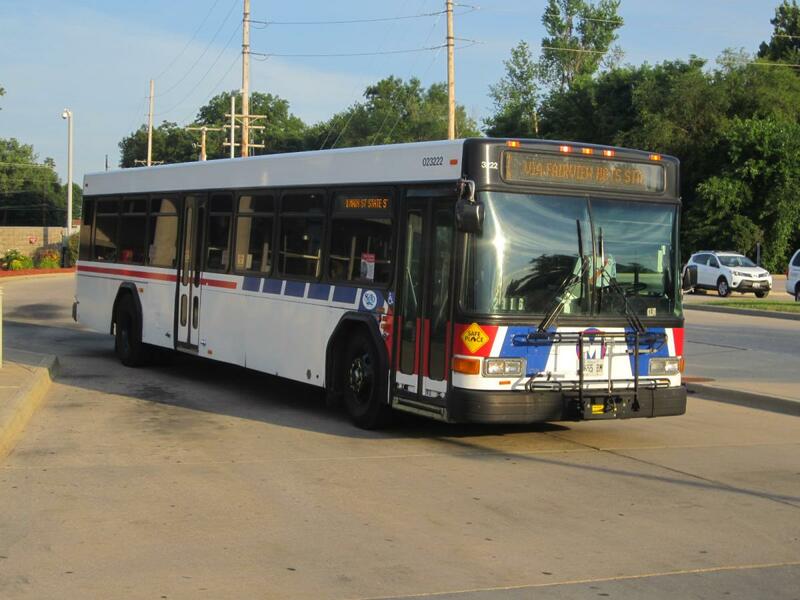 Many of them were sold for scrap or to other transit agencies such as WIU Go West and Rock Island Metro. 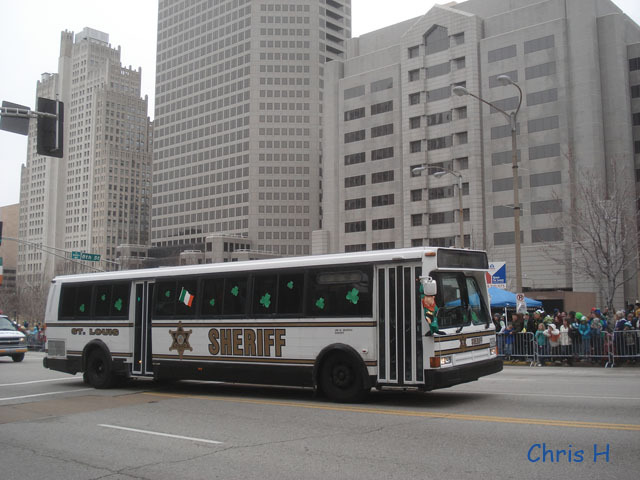 Though there is one still left in St. Louis, a 1991 Flxible Metro B is now used by the St Louis Sheriff. Here is a pic I took of the Flx at last years St. Patricks Day parade. Champaign Urbana had 6 ex 1990 metros they were eventually sent to New Orleans after Hurricane Katrina. River Valley Metro in Kankakee Il has 10 metros from St. Louis I do believe they are still in operation used for a college route. One of the best buses I ever drove love the way they leaned. 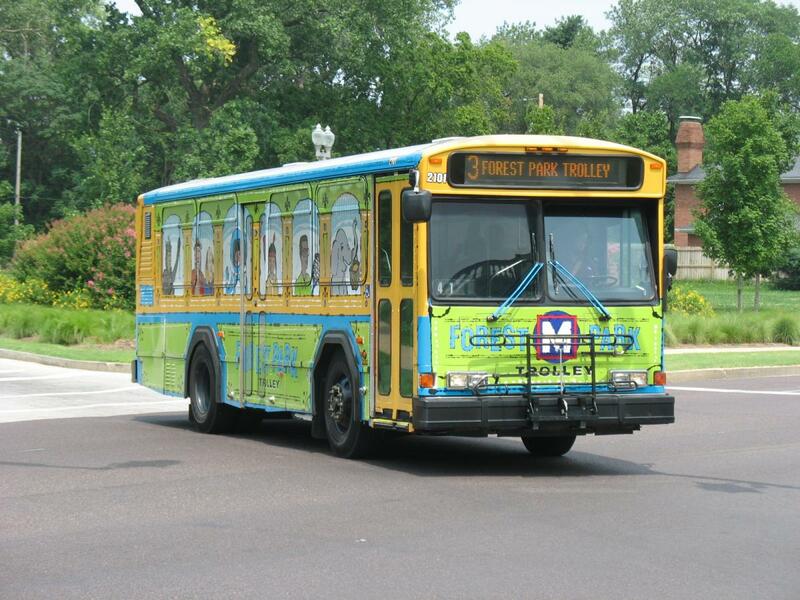 On April 1st MODOT, Forest Park Forever, and Metro are launching a Forest Park Trolley system to have alleviate traffic problems in the park . This is much like the Downtown trolleys launched last Summer with 20 minute headways and loops around the respective areas. The trolleys will again be Gillig Phantom 30' wrapped in vinyl to replicate a trolley, but in different colors and themes. 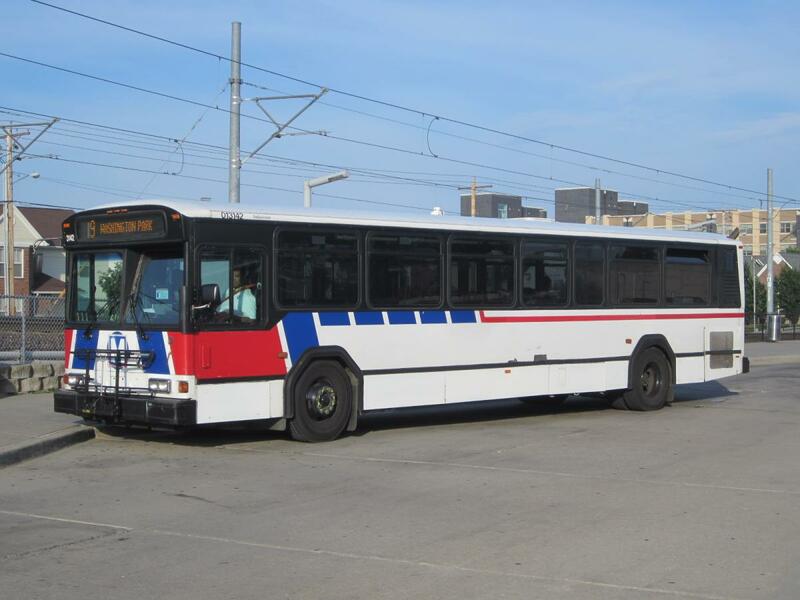 In the past Metro ran Shuttle Bugs using 1993 Orion IIs painted to look like a lady bug. 1. It seems that the 40ft. Phantoms forms the majority of the MetroBus fleet, with the 2000 buses numbered in the 2000 series and the 2001-02 buses numbered in the 3100-3200 series. 2. Their next numerous type is the 30ft. Phantoms, numbered in the 2100 and 2300 series, with the former group being of 2000 vintage and the latter group probably a few years newer. 3. The 35ft. Phantom seems to be a rarity, as I was only able to picture one of them in the 9500 series at the Illinois side of their territory. 4. The 40ft. Low Floor's are nowhere to be seen. However, I've spotted a few of the 2011 35ft. 's, numbered in the 3800 series. They are different from similar 2008 buses in the 3500 series by having a black roof line all the way to the rear of the bus. The 3500's have white roof line from the destination sign and back. 5. The Illinois side of their operation uses exclusively Phantoms. 1. What are the fleet numbers of the 40ft. Low Floor's? 2. Has the 7 40ft. Low Floor's entered service yet, and where can they be spotted? 3. When will the other 29 40ft. Low Floor's be delivered? 4. What will the 50 Low Floor's (36x 40ft. and 14x 35ft.) replace? Probably some 2000 series Phantoms? 5. Where is the best route to spot a 35ft. Phantom? 8. What are the approximate fleet numbers of the Phantoms besides the group of buses I've mentioned? Many thanks for helping me to learn more of the MetroBus operations! "Nationally, bus ridership rose by 1.8% from January through September of 2012, with 28 out of 37 large bus systemsystems reporting increases. Some of the highest bus ridership increases in large cities were reported in: Saint Louis (8.6%); Arlington Heights, Ill. (5.3%); Newark, N.J. (5.2%); and Oakland, Calif. (5.0%)." I'm in St Louis right visiting my father. This city has by far the ugliest fleet I've ever seen. It's hard seeing all these Gillig when as a so cal native, I'm so used to fancy NF Xcelsior/Restyled and NABI BRT/Restyled styling. Hell, even the new Gilligs in So Cal at least have their BRT styling. Argh. Thanks for the report. I'm with you, Gilligs are the least exciting to look at. I almost prefer the original look to the BRT--which I think is overdone and I don't like how it adds even more weight. Unfortunately, here in the middle of the country and in small cities, Gilligs are often all we see. 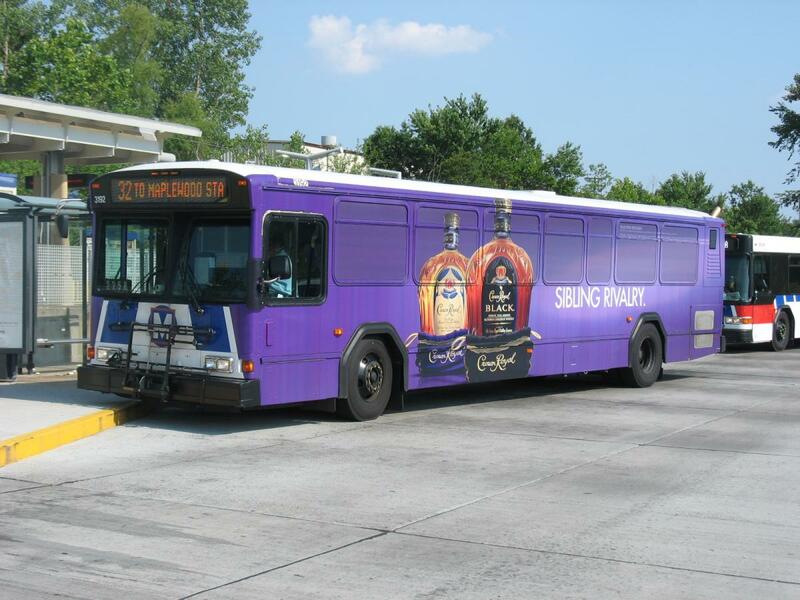 St Louis Metro experiencing ongoing growth in ridership. 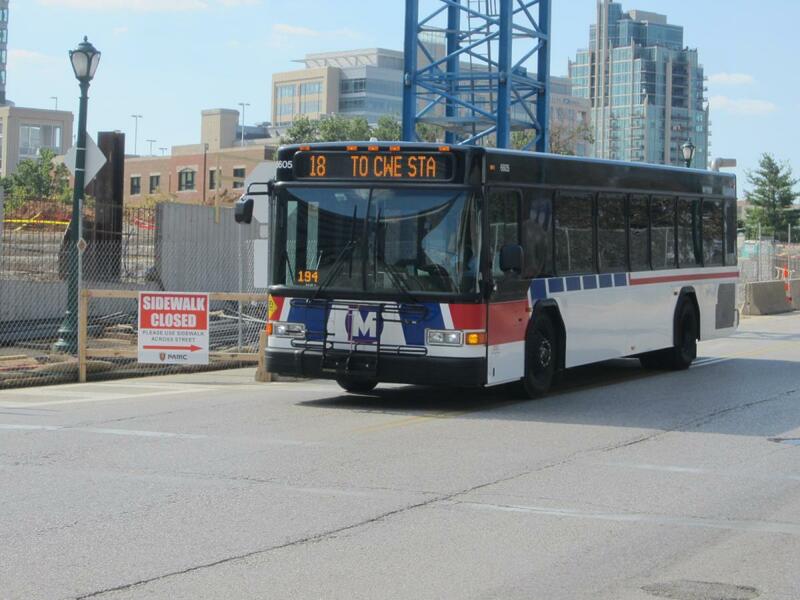 They are adding 15 refurbished articulated buses! Yep D60LF ex Ottawa OC Transpo. They have a gallery showing one of the units still in OC Transpo livery. That means both Indianapolis and St Louis will be running those! Kind of interesting that those two cities are only 250 miles apart on I-70. Photo by St Louis Today. Here is a news segment about the new artics. They will be in service starting in June. Interesting. This also possibly replacing a new, different engine! A month ago I went to the press event for Metro's launch of these refurbished New Flyer D60LFs. Here is the article from the event. 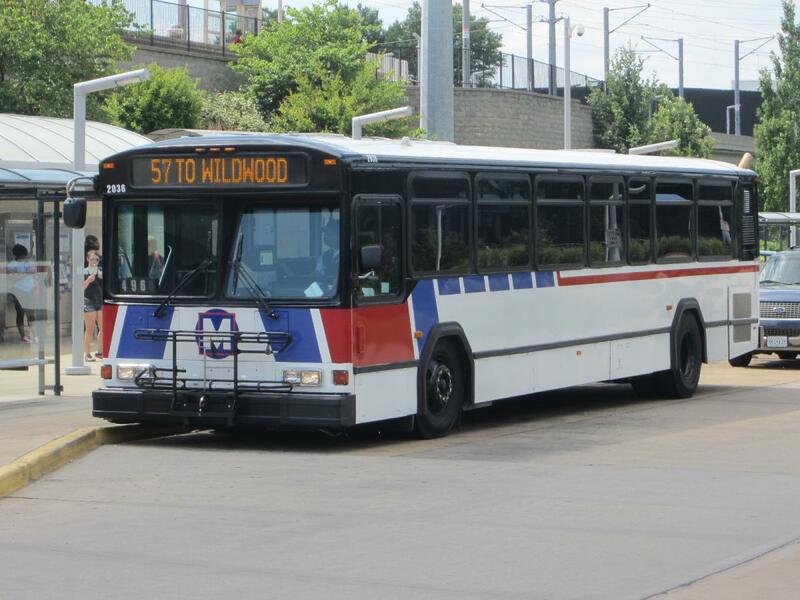 The bus side of St Louis Metro contains 3 main garages: DeBaliviere in the Forest Park area, Brentwood in the suburb of the same name and Illinois in East St. Louis. DeBaliviere garage is responsible for routes in the central and northern parts of its Missouri operating area. The routes operated by it are: 1, 2, 3, 4, 13, 14, 16, 18, 27, 33, 34, 35, 36, 36X, 41, 42, 44, 45, 47, 61, 64, 70, 74, 75, 90, 91, 94, 95, 97 and 174X. The 2100 and 2300 series of 30ft. Phantoms are largely removed from revenue passenger service, replaced by the 3800 and 6700 series of Gillig LF's. They were mostly Brentwood or Illinois buses (Except a few 2100's operating on the seasonal Forest Park Trolley back in 2011).. The 2000 series of Phantoms (supplemented by a few 3100's? )are, however still going strong at the Brentwood garage, with some still equipped with frontal dot-matrix destination signs. Meanwhile, Illinois seems to operate some 3100's and low 3200's series of Phantoms. And DeBaliviere operates the remaining 3100's and 3200's, as well as some 3400's (2004 buses). By the way, the highest-numbered 3200 series bus I've spotted in both trip is 3273. SCCTD also operates some 1st generation 40ft. 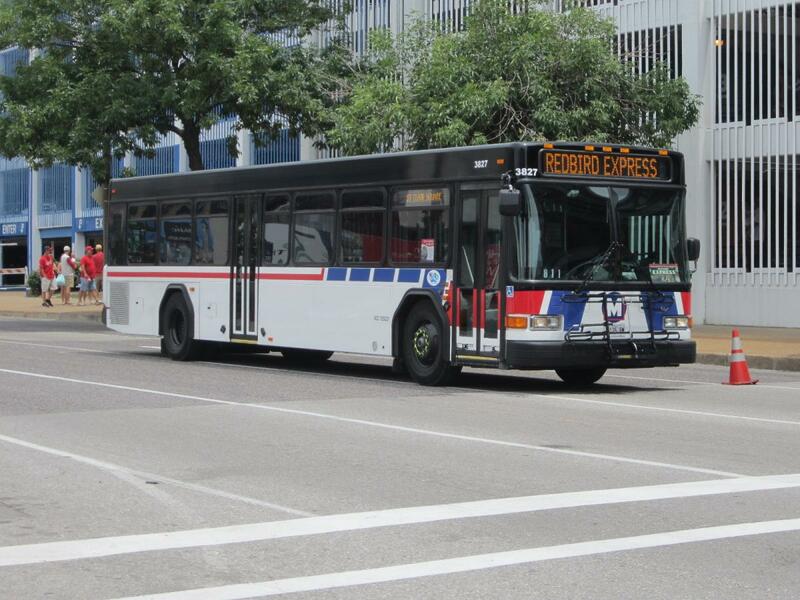 Gillig LF's in the 2070 series, as I've spotted a few of them on Redbird Express duties. I wonder if they are secondhand buses. I believe buses 3221 to 3223 (2002 Gillig LF 40ft.) 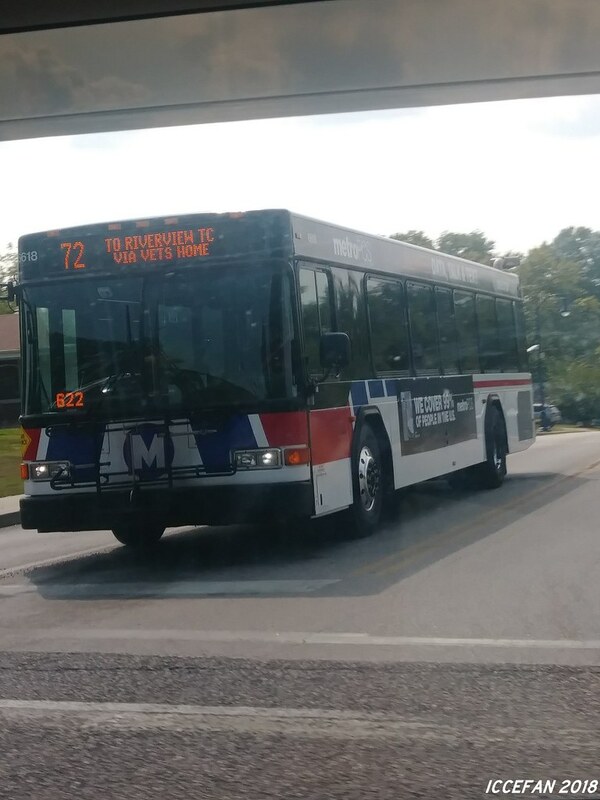 from the CPTDB Wiki are Illinois buses, as I've spotted 3222 at the Belleville Metrolink station. There are four main groups of Gillig LF's. The 3500's and 3600's are essentially identical 35ft. buses of 2008 vintage, except that the 3500's are Missouri buses (with DeBaliviere garage) and re believed to be numbered 3501 to 3526, while the 3600's are Illinois units. They are the only buses of their kind with white roof lines. I spotted a 3600 series bus in downtown St Louis on Redbird Express (The St. Louis Cardinals baseball shuttle run by the Illinois side of Metro, formally known as St. Clair County Transit District/SCCTD). I was unable to picture it due to the angle it was parked, but may try to catch one in a eventual third trip further down the road. The next series of Gillig LF's is the 3800's. The 35ft. examples are Missouri (Brentwood garage) buses, while the 40ft. 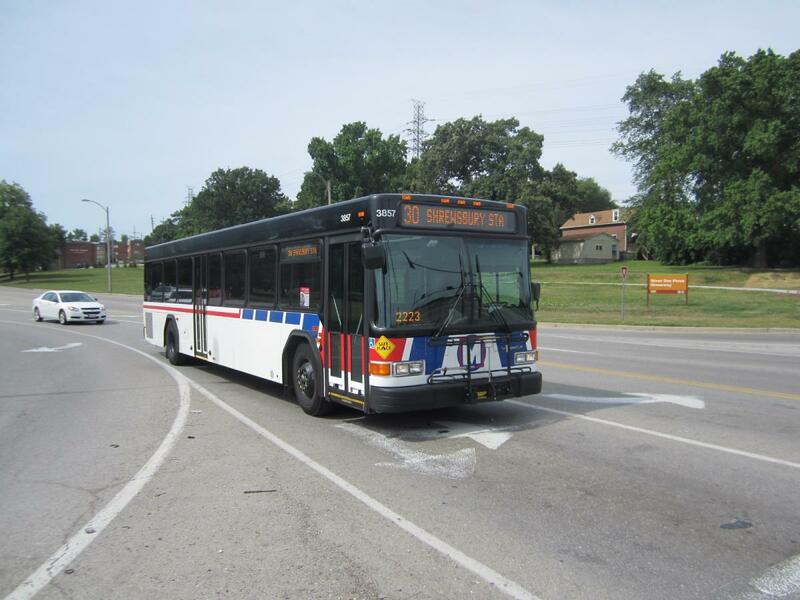 examples are either Brentwood (3830's and up) or Illinois (3820's) buses. The series that follow is the 6600's. The low 6600's are 35ft. buses with DeBaliviere garage, with the upper 6610's now serving on the Forest Park Trolley, The upper 6600's are 40ft. buses with either DeBaliviere or Illinois garage. Apparently, the newest buses are the 6700's featuring frameless windows. The 35ft. examples are Brentwood buses that probably wiped out the last 30ft. Phantoms from passenger service, with the 6740's now serving on the Downtown Trolley Line. The 40ft. 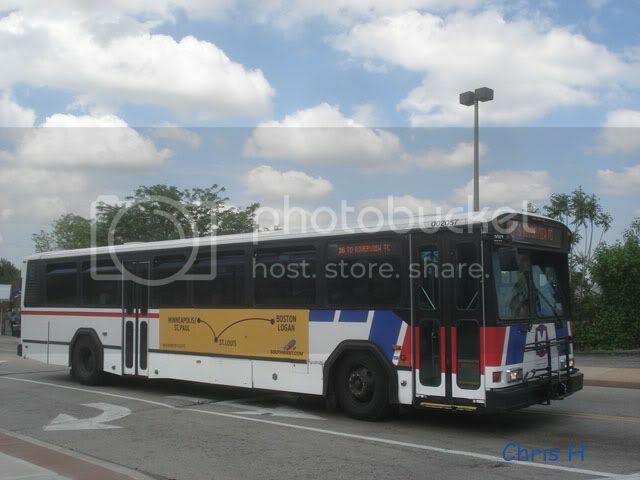 6750's are Illinois buses. The ex-OC Transpo D60LF's are in the 2200 series. However, I was unable to picture any of these in service. Hope that you'll like my analysis on Metro St Louis operations. Pictures to follow! 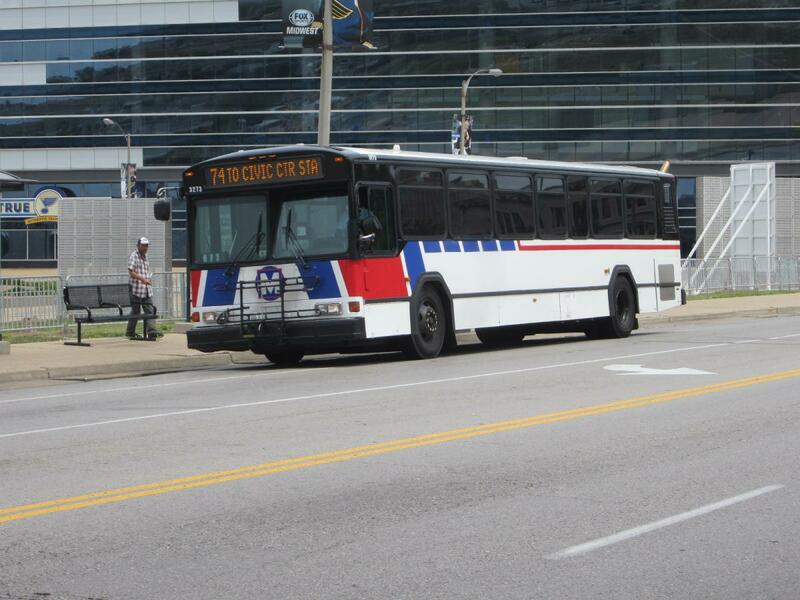 I may be heading to St Louis on Labor Day, so I can't wait to see these buses in action. Thanks for the informative "insider" post. Also, judging by the video link earlier in this thread, I'm guessing that Brentwood still has a CNG fueling station, since that appears to be where the Neoplan CNGs were based out of. I'm also guessing that most, if not all, of the St Louis Gilligs have a Voith transmission, which would probably make that system almost as dull at Pittsburgh's (save for their Metrorail system). The Neoplans were retired in 2009. Metro does not use CNG buses anymore and that CNG filling facility was removed from the garage. The fleet here consists mainly of Gilligs (Phantom and LFs) and a sprinkle of New Flyer D60LFs. The New Flyers are easily found on the 70 Grand Ave route since thats where they are currently being utilized. Metro currently has 9 of them, but by Fall all 15 should be in service. Here come the pictures! (All taken in July 2014 except otherwise stated). Bus 2101 was a 30ft. Phantom wrapped for the seasonal Forest Park Trolley and was taken at the same park in July 2011. Bus 2117 was a 30ft. Phantom equipped with a dot-matrix destination sign and was taken near the Ballas MetroBus Center in Town and Country (Western St. Louis County). Bus 2304 was a similar but slightly newer bus equipped with a LED destination sign and was taken at the same location as 2117. 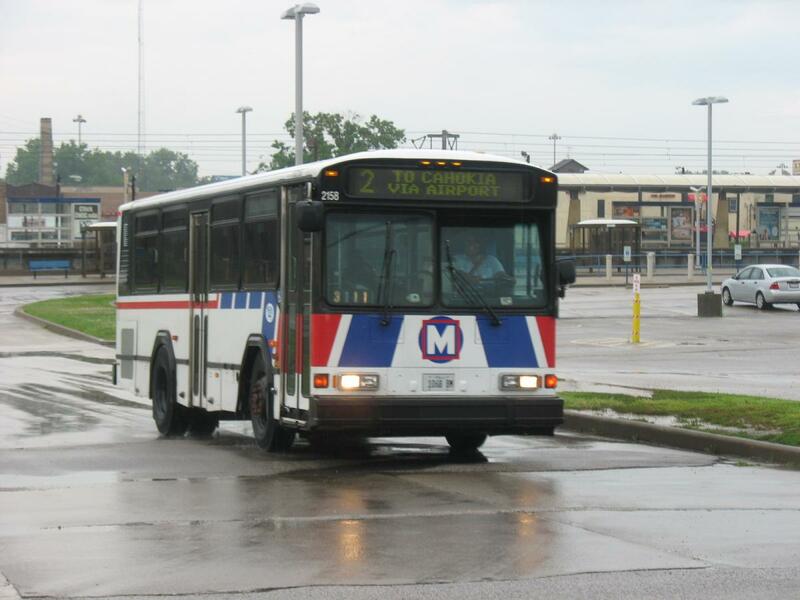 Bus 2158 was similar to 2117 and was taken near the 5th & Missouri MetroLink station in East St. Louis, Illinois in July 2011. Bus 9524 was a 35ft. Phantom and was taken at Madison County Transit's Collinsville Station in Collinsville, Illinois in July 2011. Bus 2018 is a 40ft. Phantom equipped with a dot-matrix destination sign and was taken at the Civic Center MetroBus Center at downtown St. Louis. 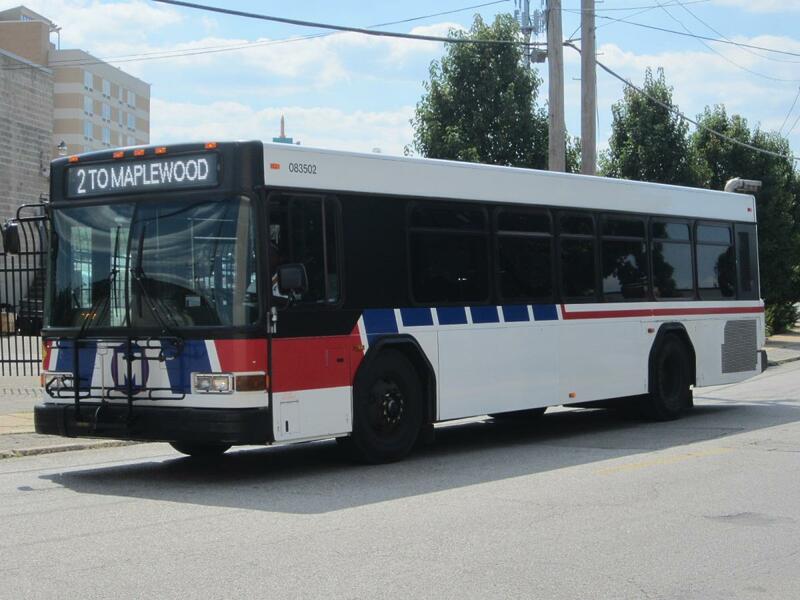 Bus 2036 is a similar bus equipped with a LED destination sign and was taken at the Maplewood MetroLink station. Bus 3192 is a 2001 Phantom 40ft. and was taken at the Rock Road MetroLink station in July 2011. Bus 3273 is a similar 2002 bus and was taken at downtown St. Louis. 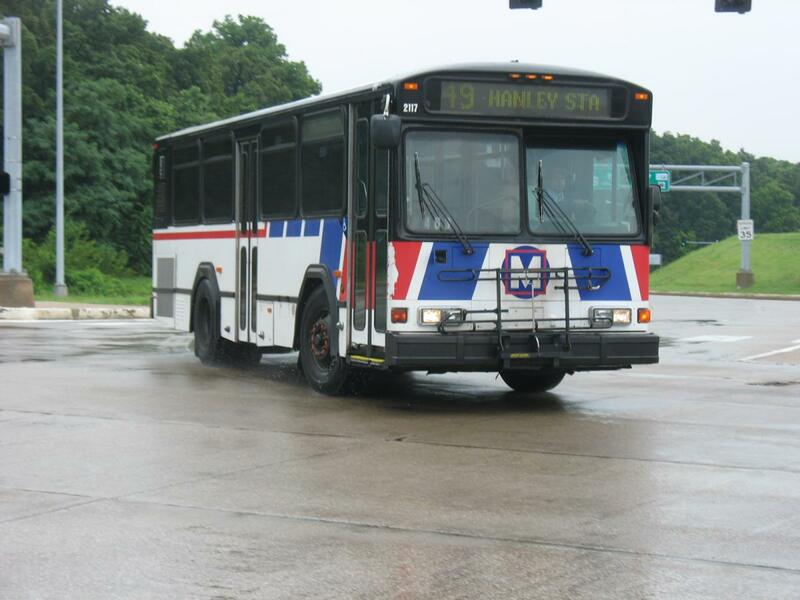 Bus 3402 is a 2004 Phantom and was taken at the North Hanley MetroLink staton. Bus 3142 is a 2001 Phantom 40ft. assigned to Illinois and was taken at the Emerson Park MetroLink Station in East St. Louis. Bus 2077 is a early 2000's 40ft. 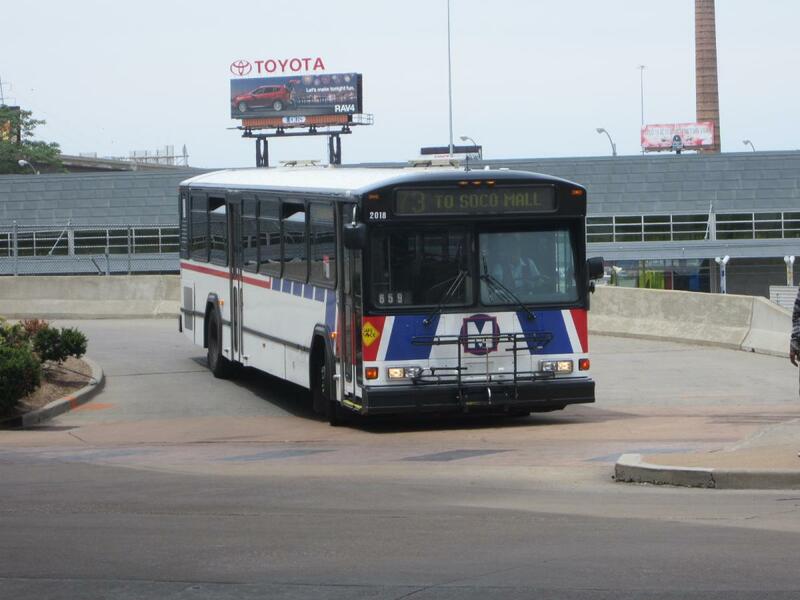 Gillig LF assigned to Illinois and was taken at downtown St. Louis on Rebird Express duty. Bus 3222 is one of only three of its kind (2002 Gillig LF 40ft.) and was taken at the Belleville MetroLink station. Bus 3502 (a 2008 Gillig LF 35ft.) 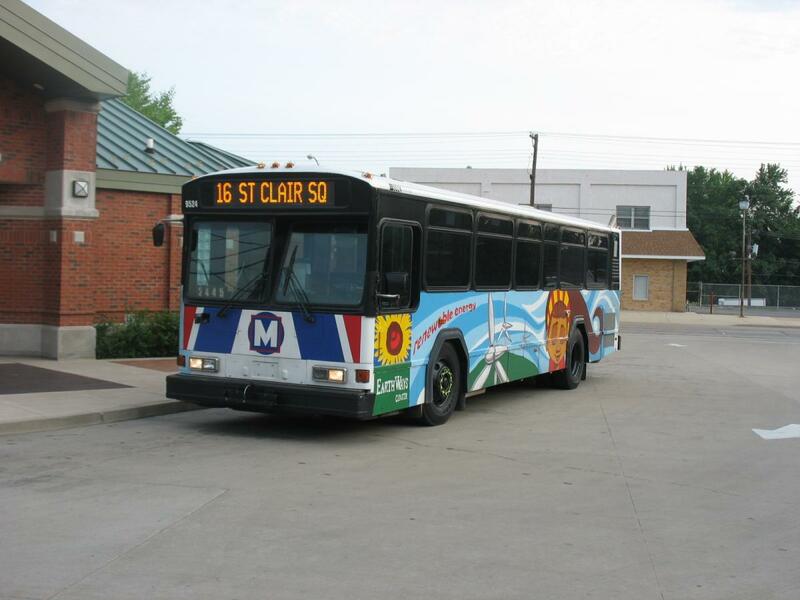 is among the first low-floor buses for the Missouri operation and was taken near the Delmar Loop MetroLink Station. Bus 3807 is a Gillig LF 35ft. from the second major batch and was taken near the Shrewsbury MetroLink station. Bus 3857 is a similar 40ft. bus from the same batch and was taken at the same location as 3807. 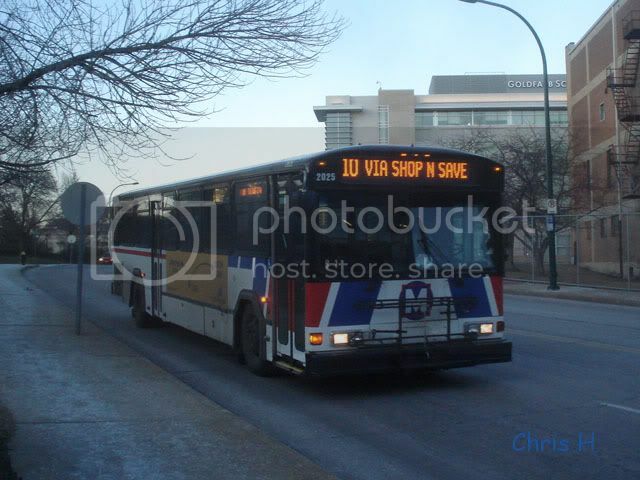 Bus 3827 is an identical Illinois bus, and was taken at downtown St. Louis on Rebird Express duty. Bus 6605 is a 35ft. 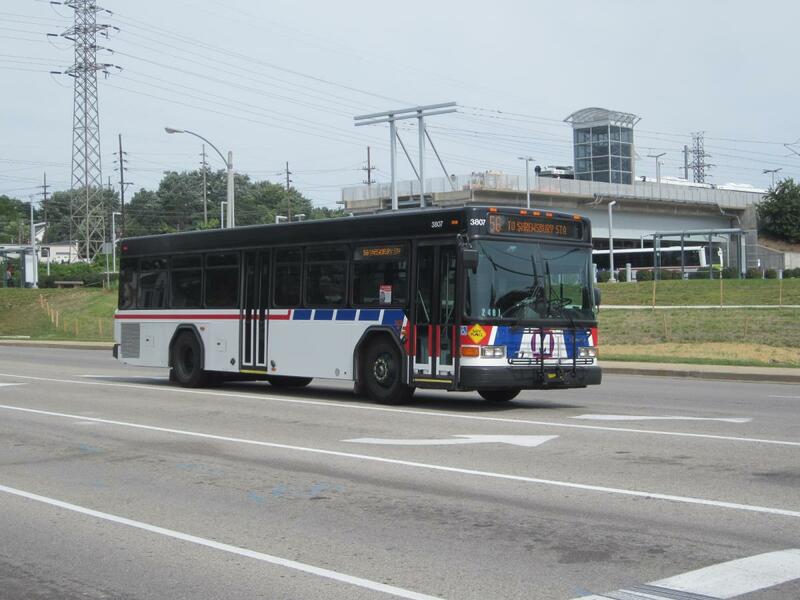 Gillig LF from the third batch and was taken near the Central West End MetroLink station. 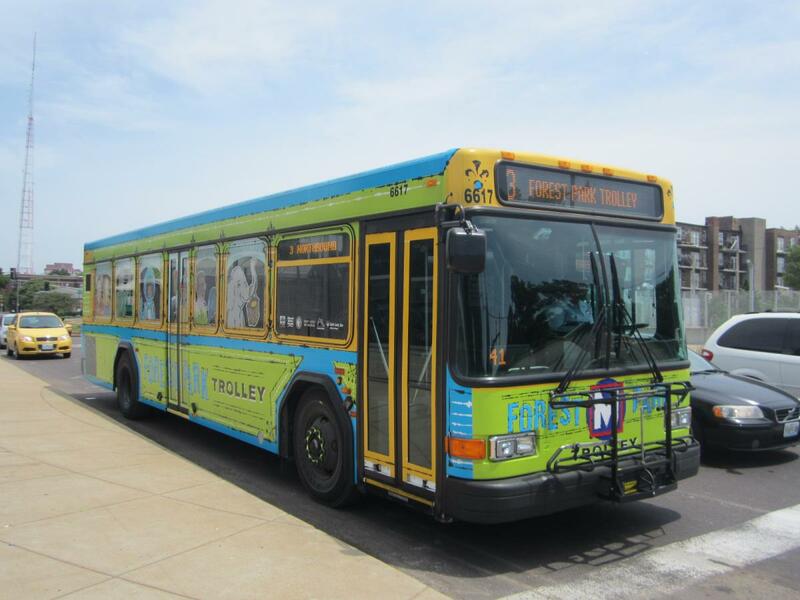 Bus 6617 is the current order on the Forest Park Trolley and was taken near the Forest Park DeBaliviere MetroLink station. Bus 6639 is a 40ft. bus from the same batch and was taken at the Civic Center MetroBus Center. 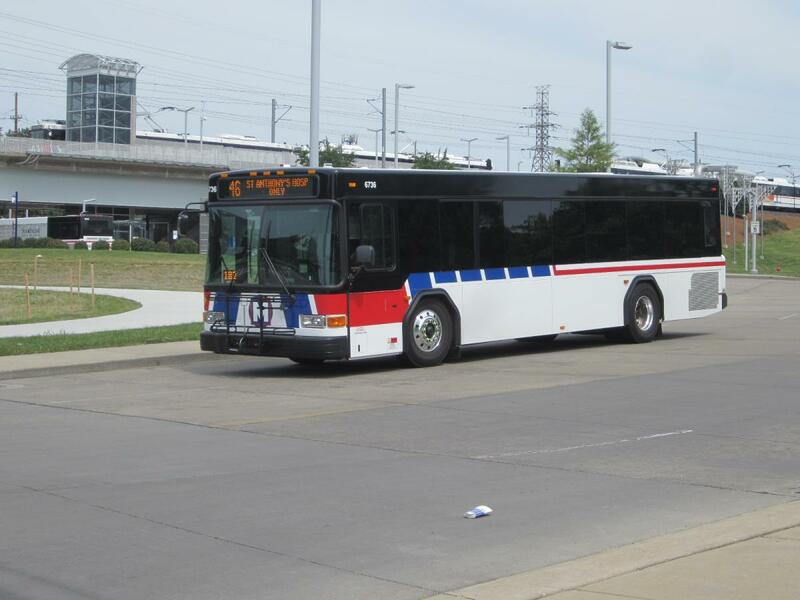 Bus 6654 is an identical Illinois bus and was and was taken at the Belleville MetroLink station. Bus 6736 is a 35ft. Gillig LF from the latest batch and was taken near the Shrewsbury MetroLink station. 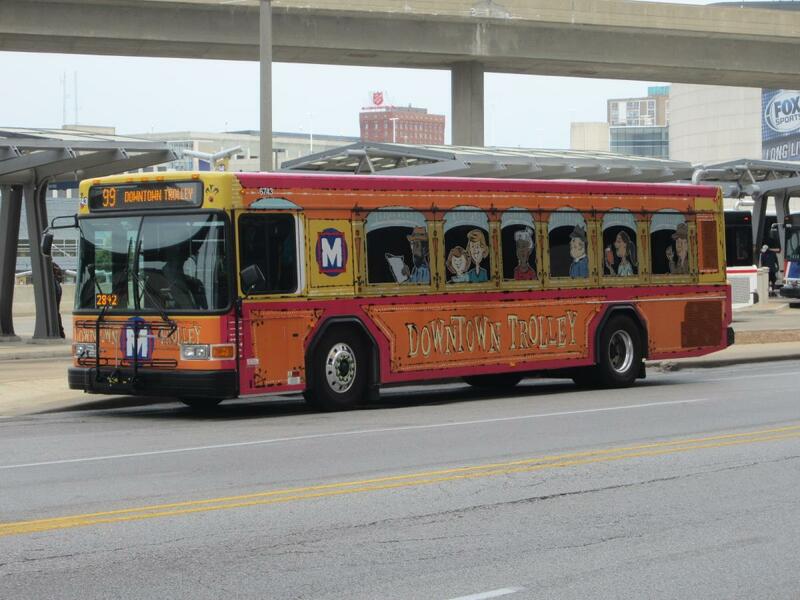 Bus 6743 is wrapped for the Downtown Trolley and was taken at the Civic Center MetroBus Center. Finally, bus 6752 is a 40ft. bus from the same batch assigned to Illinois. 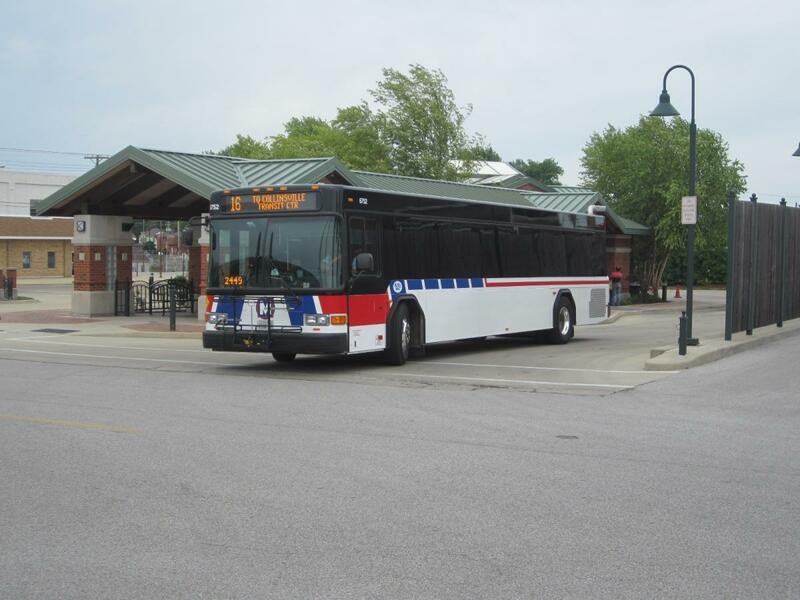 It was taken at Madison County Transit's Collinsville Station in Collinsville, Illinois. Hope that the above pictures will give a clearer operational picture on this agency and wish you enjoy the photos! 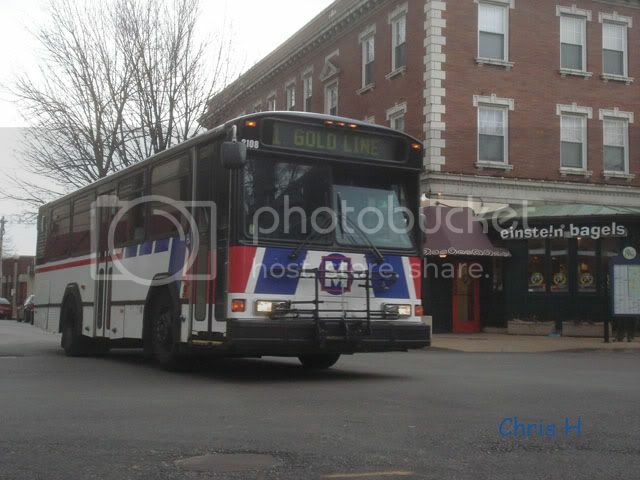 My Metro St. Louis gallery is available at https://picasaweb.google.com/113539580245756454797/MetroStLouis. 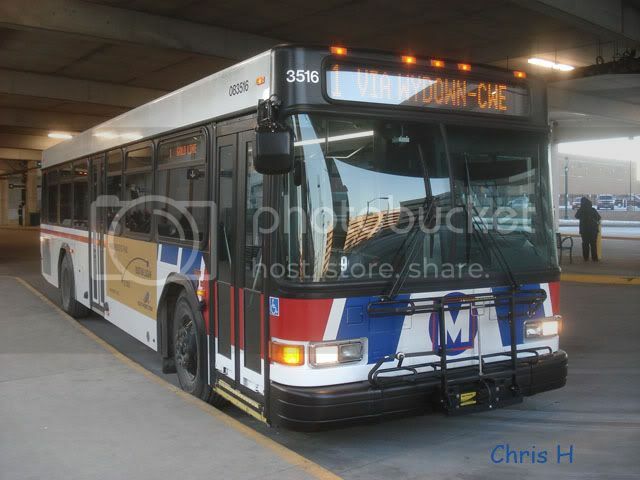 Here is the coverage from last June of STL Metro's New Flyer D60LFs from my blog. I actually took a picture of 3502 at North Hanley working the 44 on Labor Day. I guess I'm not the only one to have seen this oddball. Some of the 3500s have brighter destination signs and a few have been repainted with the black tops. Back in June bus 3503 was painted during Pride Fest. It will be like that for a year before it will be repainted back to original Metro colors. The 3800s, 6600s, and the 6700s all have the black tops. Through a partnership St. Louis Metro looks to buy some electric buses from Gillig.